Dan Lloyd celebrated a maiden Dunlop MSA British Touring Car Championship victory back on home soil at Croft Circuit. 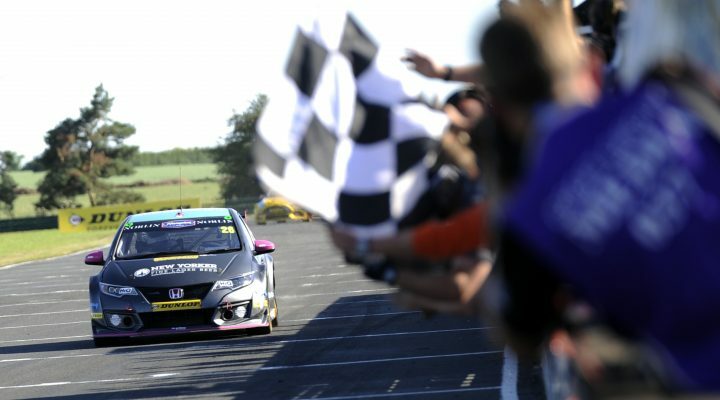 Not only was it the first ever BTCC win for the Yorkshireman but also the first top-step success for BTC Norlin Racing in Britain’s premier motorsport series. The reverse grid draw yielded pole position for Lloyd and the perfect opportunity for both he and Norlin to capitalise. Between races two and three, the outfit had its work cut out changing Chris Smiley’s engine while the other half of the garage prepped Lloyd’s car to start the finale from first. The 26-year-old flew off the line and retained his advantage, increasing his lead on the fast-starting Ford Focus RS of Tom Chilton as each lap passed. Come mid-distance of the race, Lloyd was able to manage the gap and at the chequered flag it stood at some six seconds, ensuring he was more than good value for the win. A delighted BTC Norlin Racing Team Principal in Bert Taylor, said: “I am so proud of what we achieved at Croft. It was a difficult couple of weeks after the damage we sustained to both cars at Oulton Park. The team worked very hard to get both Hondas ready for the trip to North Yorkshire. “I am thrilled for Dan on securing his first win in the BTCC and I couldn’t be happier that we have been able to give him the car to not only get the job done but to produce such a dominant win. “It was a difficult weekend for Chris but he showed he has the pace and he will bounce back stronger at Snetterton. “I am leaving Croft proud of the team and what we have here at BTC Norlin Racing,” said Lloyd. “I’m excited to see what the rest of the season has in store. “It was an amazing weekend! A Massive thank-you for the team, who worked incredibly hard to get my car rebuilt after Oulton Park. They put in long hours and had two late night finishes at the track to get everything sorted for Sunday. “We started on the back foot this weekend and being 28th in Free Practice 1 there was a lot that we needed to do. We worked hard over Saturday, making some big changes to the car to suit me a lot more, which I was really happy with and even into race day we were still tweaking the car a lot to make improvements, even up to race three.